Comm Eye Health Vol. 12 No. 30 1999 pp 25 - 28. Published online 01 June 1998. An overview of some common eye infections, causative pathogens and spread mode is given. This is followed by an outline of general infection control principles with additional specific considerations for ophthalmic practice. Conjunctivitis may be bacterial, viral or chlamydial and is a common cause of unilateral or bilateral infected red eyes. Bacterial conjunctivitis, usually caused by Staphylococcus aureus, is more common in children. The signs and symptoms are sticky, purulent discharge, foreign body sensation, with peripheral conjunctival redness. The pupils are normal and the cornea is clear. The visual acuity is usually unaffected unless there is corneal complication. Bilateral purulent discharge in the newborn requires urgent referral as this may indicate infection with Neisseria Gonorrhoeae or possibly Chlamydia. The patient and parental sexual partners must be examined and treated by a specialist healthcare worker as soon as possible. Neisseria Gonorrhoeae infection may result in loss of sight if treatment is delayed. Other viral infections include herpes simplex, varicella zoster and molluscum contagiosum. Herpes simplex conjunctivitis may be present together with a dendritic corneal ulcer. Varicella zoster conjunctivitis occurs secondarily to ophthalmic shingles. molluscum contagiosum is commonly associated with a mild, but chronic, follicular conjunctivitis and superficial keratitis, which does not respond to antibiotics. Measles and mumps are also causes of conjunctivitis. Blepharitis (inflammation of the eyelids) tends to run a chronic course and may occur together with conjunctivitis because the structures involved are anatomically joined. Staphylococci and propionibacteria are common pathogens. In the USA Staphylococcus epidermidis is more commonly isolated in patients with blepharitis (95.8%) than Staphylococcus aureus (10.5%).4 Signs and symptoms are red, crusty lid margins, mild lid swelling, itchiness, dry sensation and occasional lacrimation. Vision is normal unless the cornea becomes involved. The condition commonly occurs in unhealthy environments or in those with skin problems. Daily lid ‘scrubs’ and a healthy diet are essential in managing this chronic disorder. A course of antibiotic eye ointment may be prescribed. Infection may have a profound effect on the patient’s general health as well as damaging sight. The healthcare worker must be aware of the sequence of events in the transmission of infection. Figure 1 shows a possible chain of infection leading to acute conjunctivitis. Table 1 shows how some viruses can be transmitted in a healthcare environment (see also reference below to adenoviral infection in ophthalmic practice). In addition, patients with an eye infection need to be given clear instructions as well as appropriate medication to encourage recovery. This may be supported with a written advice sheet. Box 1 gives the necessary information. This could be reproduced as an individual handout or for notice board display in the clinic. In many western hospitals, in recent years, the appointment of an Infection Control Officer (usually a nurse) has become commonplace. This highlights the significance and challenge of infection control within clinical areas. Indeed a considerable number of infections are actually acquired within a hospital setting. All healthcare workers of all disciplines have responsibility for infection control and this begins with their own personal hygiene. Individuals with any infection should not have direct patient contact. Any infected or potentially infected lesion must be covered with an occlusive dressing and reported to the person-in-charge who will decide if the staff member should take sickness leave until the infection has cleared. Clothing should be changed daily. Studies have shown that hospital uniforms, over the course of a day, become a source of bacterial infection. Jewellery, including wristwatches, should not be worn and fingernails should be kept clean and cut short. Clothing worn in the operating theatre must not be worn in other areas. Hair must be kept clean and covered. Beards are a source of infection. Facemasks must be worn properly to cover the nose, mouth and chin completely, changed for each operation and disposed of carefully. Cotton masks must be washed before re-using. Hands are the most important ‘instruments’ of healthcare workers and also the principal source of cross-infection in a healthcare setting. Handwashing is the most important of all infection control measures, yet it is usually performed inadequately. Both technique and frequency are important – see Boxes 1, 2 and 3. Gloves should be worn on both hands whenever there is potential contact with blood and other body fluids. The wearing of gloves is recommended for all eye surgery. For many years it was accepted that some ophthalmic surgeons chose not to wear gloves because of reduction in touch sensitivity but this practice is no longer an option because of the risk of HIV and hepatitis B infection. 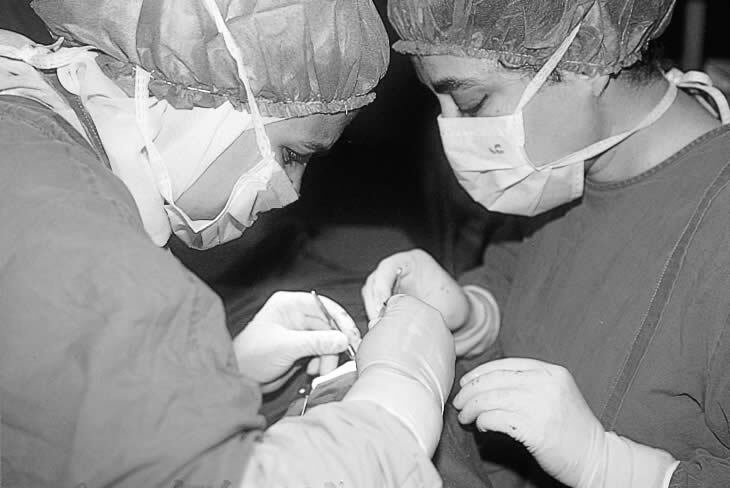 A new, sterile pair of gloves should be worn for each patient contact. Good quality gloves may be re-sterilized but should be checked for damage – e.g., by filling with water, turning inside out and allowing to dry before re-sterilizing. An adequate supply of gloves should always be available. Allergy and sensitivity to the latex material is currently being widely discussed. All clinical waste must be disposed of carefully. Soiled dressings and surgical remnants must be burned immediately. Soiled linen must be removed immediately and washed separately from routine changes of bedding, etc. Disposable needles must be disposed of immediately after use, and separately in a closed impenetrable container, appropriately labelled. This may be burned or buried, preferably daily. Therefore, a small container is better than a large one. If an accident occurs, i.e., a prick with a used needle or sharp instrument, the wound should be allowed to bleed freely for a few minutes, then washed with soap under running water and covered with a sterile dressing. The HIV and hepatitis status of the patient, on whom the needle was used, should be noted. The incident must be reported to the person-in-charge and the injured worker examined by a medical practitioner. Needles should not be used more than once but if this is not possible it is essential that proper sterilization procedures are followed.6 Needles, used for the removal of corneal foreign bodies, etc., must not be left on the slit-lamp table top! Spillages of body fluids must be wiped with disposable paper tissue or cloth, which must then be burned, and the surface cleaned immediately with detergent and water. Heavy-duty gloves should be worn when disposing of any waste material and cleaning after spillages. Patients expect, and have a right, to be cared for in a clean, safe environment and all healthcare workers have responsibility to provide this. Basic cleaning of the hospital environment is a cost-effective method of infection control and must always be a pre-requisite for any subsequent disinfection and sterilizing procedures. The areas/items requiring regular attention are walls and ceilings (often forgotten or ignored), floors, tables, stools and chairs, shelving and work surfaces. Disposable healthcare materials appeared on the western market almost 40 years ago with the promise of raised standards, labour-saving practices and guarantee of reduction of infection rates. Some economic situations, however, have encouraged the practice of re-use of disposable items to save money. Recycling must be carefully considered and monitored closely to ensure safety is not threatened. Where the patients’ meals are provided by relatives, care must be taken because contaminated food can contribute to hospital-acquired infection. A separate unit for eye patients is ideal, but where this is not possible care must be taken that patients with open infected wounds, ulcers or bed-sores are not accommodated in the same area as eye patients. Patients with eye infections should be separated from other ophthalmic patients in the ward, especially those who have had eye surgery. If surgery is performed on an infected eye the operation must be scheduled last on the operating list and the theatre cleaned thoroughly afterwards. Eye infection can be spread by healthcare workers through simple social greeting of patients, i.e., shaking of hands. Patients often rub their eyes and contaminated hands will transfer the organism to the healthcare worker. It is important that hands are washed immediately before performing an eye examination and after the patient has left before greeting another patient. The areas which come into contact with the patient must be washed with soap solution between patient examinations – chin rest, head rim, not forgetting the hand grips! These should be wiped after use on disposable paper tissue and then placed (tip only) in a small pot of sodium hypochlorite 1% for at least 10 minutes between patients. (NOTE: The prism must be rinsed in sterile water and dried before use!!) If there is suspected adenoviral infection the soaking must be extended to 30 minutes before re-using the same tonometer prism. A fresh sterile pot and new solution of sodium hypochlorite must be provided for every clinic session. This should be stored in a container of sodium hypochlorite 1% for at least 10 minutes between patients, rinsed in sterile water or saline and wiped dry before use. A fresh solution must be provided before each clinic session. NB. Sodium hypochlorite causes corrosion – do not use stainless steel containers for the above. 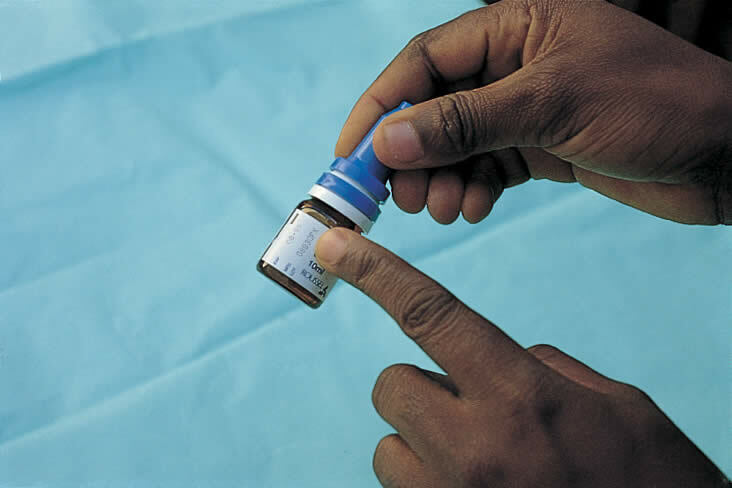 Ideally, each patient should have his or her own bottle of drops and, where there is known infection, separate bottles for each eye! However, in many situations this may be economically impossible. Care should therefore be taken to avoid eyedropper contact with eyelids, lashes, eyebrows and facial skin. Where possible a single-use dispenser should be used in out-patient examinations. Expiry dates must be checked, as out-of-date drops can be a source of infection. An infected eye must never be covered with a pad and/or bandage. Used eye dressings must be disposed of immediately and burned. 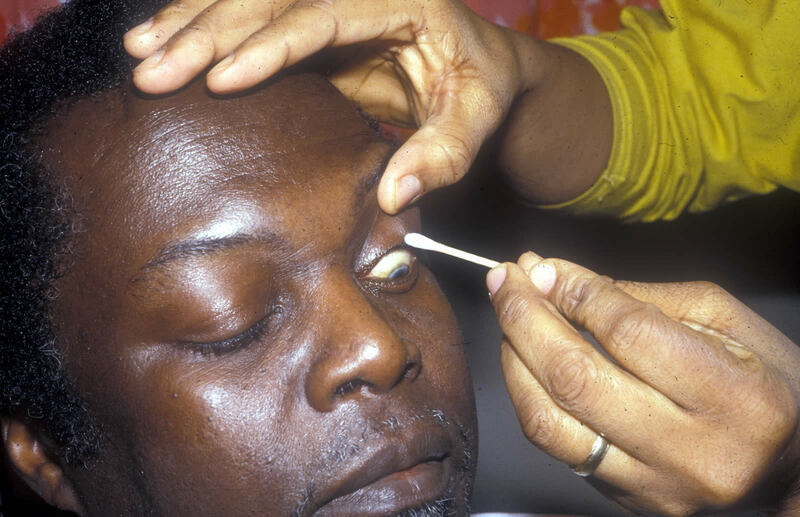 Eye shields must be washed before being re-applied and, in known infected cases, must not be used on other patients. Cotton wool, gauze swabs or tissues, used when instilling drops or ointment, must be disposed of immediately. Wearers should be encouraged to wash their spectacles daily. Eye infection can happen anywhere as eyes are particularly susceptible to many organisms including Gram -ve bacilli, adenoviruses, herpes simplex virus and fungi. Cross-infection is a costly and continuing concern. Multi-resistant Staphylococcus aureus (MRSA) has made alarming news worldwide as treatment is very difficult. Lives, as well as sight, have tragically been lost. 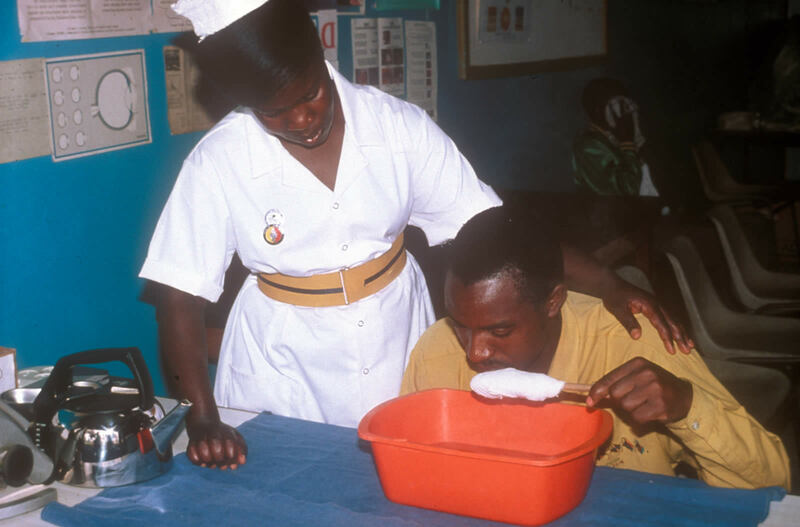 Health workers must aim to limit hospital-acquired infection. Lack of motivation and poor microbiological knowledge will result in non-compliance. Eye staff are advised to develop and teach an appropriate infection control policy with regular reinforcement and review.